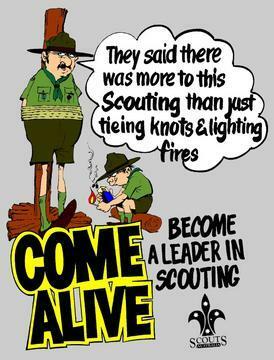 WHAT IS A SCOUT LEADER???? Somewhere between adolescence and old age, there occurs in human development a person who is physically and psychologically impossible. It is the unfathomable one known as the Scout Leader. A creature undefined by psychologists, misunderstood by the Association, worshipped by Scouts, either admired or doubted by parents and unheard of by the rest of society. A Scout Leader is a rare combination of Doctor, Lawyer, Indian and Chief. He is a competent Child Psychologist, he is a non paid baby sitter with neither television or refrigerator to indulge in. He is a strict disciplinarian with a twinkle in his eye, a minister to all faiths with questions about his own. He is a referee, a coach, a teacher and adviser. He is an example of manhood in worn out shoes, a shirt two sizes too large and a hat two sizes too small. He is a humorist in a crisis, a doctor in am emergency, a song leader, an entertainer, a skit director. He is an idol with his head in a cloud of wood smoke and his feet in mud. He is a comforter in a leaky tent on a cold night and a pal who has just loaned someone his last pair of dry socks. He is a teacher of the outdoors, knee deep in leeches and nettles. 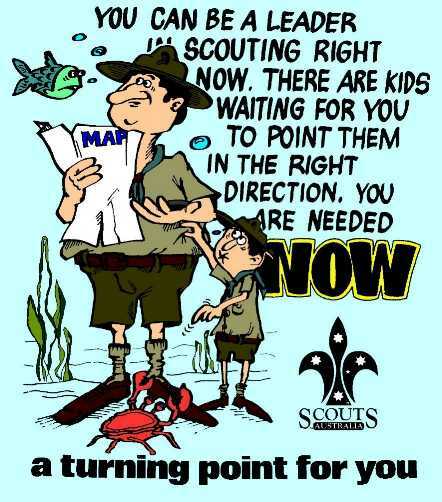 Scout Leaders dislike the whistle, waiting in queues, inspections and rainy days. They are fond of sunbathing, exploring, teaching new games, an old car named ‘Lady’ and sharing a yarn. They are handy for patching up broken friendships, bloody noses and torn jeans. They are poor at crawling out on raining mornings, remembering the salt and getting to bed early. A Scout Leader is a friendly guide at camp in the middle of a dark, cold, rainy night on the long winding trail to the loo. He is a dynamo in his hour off, exhausted the next hour but recuperates in time for the next break. Who but a Scout Leader can cure instantly that sore thumb, air out damp sleeping bags, play sixteen active games in succession, whistle Waltzing Matilda through his teeth, carry two packs, speak pig Latin in French, stand on one hand, lead thirty-seven verses of “You can’t Get to Heaven” and eat three helpings of overcooked under-salted camp dinners. A Scout Leader is expected to repair ten years damage to Tommy in ten weeks, make John into a man, rehabilitate Davey, allow Roy to be an individual and help Peter adjust to the Group. He is expected to lead the most prized possessions of many adults often much older than him. He is expected to lead them in fun and adventure even though his head aches, to teach them to live in the out doors, even though he spends eleven months of the year in a shop or office, to teach them indigenous activities when he can’t even spell the word, to guide them in social adjustments, to ensure safety and health with a sunburnt nose, bad sinusitis, bandaids on his fingers and blisters on his heels. You wonder how he can stand the pace and the pressure. You wonder if he really knows how much he is worth and somehow you realise you can never thank him enough when, as he leaves at the end of a camp, waves goodbye and yells enthusiastically “See you all on Scout night”.